Chosen by John Updike as a Today Show Book Club Pick. 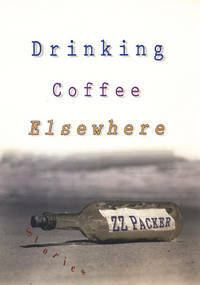 Already an award-winning writer, ZZ Packer now shares with us her debut, Drinking Coffee Elsewhere . Her impressive range and talent are abundantly evident: Packer dazzles with her command of language, surprising and delighting us with unexpected turns and indelible images, as she takes us into the lives of characters on the periphery, unsure of where they belong. We meet a Brownie troop of black girls who are confronted with a troop of white girls; a young man who goes with his father to the Million Man March and must decides where his allegiance lies; an international group of drifters in Japan, who are starving, unable to find work; a girl in a Baltimore ghetto who has dreams of the larger world she has seen only on the screens in the television store nearby, where the Lithuanian shopkeeper holds out hope for attaining his own American Dream. With penetrating insight that belies her youth—she was only nineteen years old when Seventeen magazine printed her first published story—ZZ Packer helps us see the world with a clearer vision. Drinking Coffee Elsewhere is a striking performance—fresh, versatile, and captivating. It introduces us to an arresting and unforgettable new voice.